Publishers also now have a metric showing ad session length. 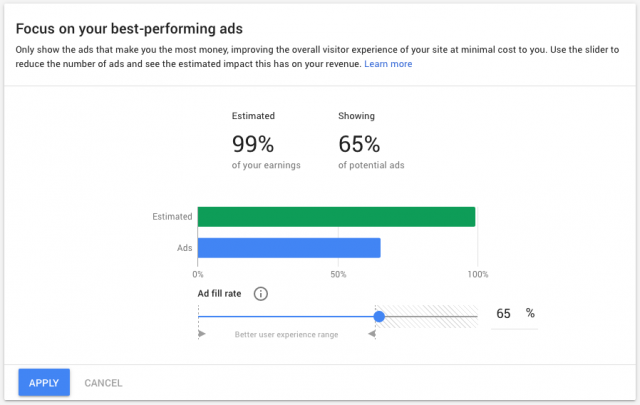 Google AdSense has announced two new Experiments features to give publishers a deeper understanding of how certain factors affect their users and advertising earnings. The Experiments page now includes a new metric called “Ad Session Length.” This metric shows how long a user spends on your site, helping publishers gauge the user experience, with longer ad session lengths being more desirable. The Ad Balance tool was initially launched in early 2017 but was on-again-off-again in availability as bugs were worked out. The tool is now back for good. The tool empowers publishers to reduce the number of ads shown (or ad fill rate) to users in order to weed out poorly performing ads. Limiting the lesser performers allows the weight to be given to higher-revenue ads, with the added benefit that they are likely to provide a better experience for users. Ad Balance will also analyze the impact on site revenue if you lower your ad fill rate. Google cautions that more site traffic data results in more accurate predictions of future ad revenue. The interface has an Ad fill rate slider that publishers can move back and forth; it updates the earnings vs. what ad fill rate you choose on the slider. Once you have it at the setting you want, hitting “apply” will change the settings. AdSense also announced two shifts in existing services. Experiments will now autocomplete for those marked as “ready to complete” and in which there’s no winner. Users can manually choose a winner during that time period; otherwise, they don’t need to do anything. In addition, Experiments completed over a year ago will be removed. Publishers can hold onto the data if they’d like by using the “Download Data” option on the Experiments page.